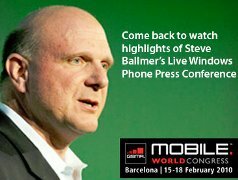 Microsoft’s CEO Steve Ballmer just announced Windows Phone 7 Series, the latest version of its mobile operating system. Microsoft is presenting the new mobile phone operating system live at the Mobile World Congress in Barcelona. Among the features that Microsoft is promoting on the OS is “for the first time ever, Microsoft will bring together Xbox LIVE games and the Zune music and video experience on a mobile phone.” Read more at Microsoft Phone 7 Series page.